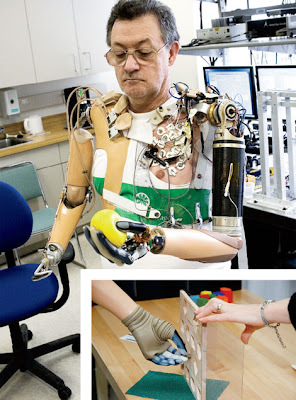 This is as close to being a cyborg as one can get these days if you happen to be physically-challenged like this man. With the advancement of new technology, it is now possible for such people to live a life somewhat similar to other people with complete appendages. This "bionic" arm system, called Proto 1, gives the sensation of grip to the user, Jesse Sullivan, a lineman who lost both arms in an accident. The sensors on his chest allow him to receive impulses to the nerves that translate as grip. Thus, he can grip hard or soft.